With the 'anti-firearms' moves that started in the 1980's a young American woman moved to Australia. Rebecca Peters studied law for two years and then quit, she became employed by 'The Australian Broadcasting Commission' (ABC), and then started 'The National Coalition for Gun Control' (NCGC). At the time she also coyly joked about the rumours that her father was 'CIA'. The 'National Coalition for Gun Control' was considered a political lobby group, but after Rebecca Peters founded the 'International Action Network on Small Arms' (IANSA) in the United Kingdom, which again was considered as a 'political lobby group', it appeared that both of these bodies were in fact NGO's that is 'Non-Government Organisations'. When Rebecca Peters returned to America as an 'Australian citizen'; she initiated the 'Million Mothers March against Firearms' and was given a 'scholarship' by one of the George Soros foundations, and continued her work for the confiscation of firearms. In Australia in 1995 there was another apparent NGO 'lobby group' called the 'Australian Institute of Criminology' (AIC) which worked hand in hand with the NCGC and signed a 'MOU' (Memorandum of Understanding) with the United Nations in regard to the confiscation of firearms. The problem with the AIC was in 1998 the AIC was listed as an 'Intelligence Unit' within the Federal Attorney General's Office. The George Soros Foundations then moved into 'Global Politics' by establishing 'Freedom' foundations around the world. When politicians supported by these Soros Freedom foundations entered into general elections and lost, which was normally the case, they then 'created' revolutions, by calling the elections 'fixed' and by force threw the incumbent government out, and 'created their own government which was then recognised as a legitimate government by America and the European Union. There were several such 'Soros' sponsored revolutions, and they were identified as 'colour revolutions'. It may be remembered by some that George Soros didn't like George W. Bush and in about 2002, Soros pledged $300m to oppose the then incumbent American President. President Obama was Soros' man. Terrorism n, systematic intimidation as a method of governing or securing political or other ends. Terrorism is also referred to in the Reesian Theory of War as "Low Intensity Operations". Terrorism can also be called, "Politically motivated Violence". In July 2012, Hillary Clinton and the American State Department were debating the possibility of a 'United Nations' treaty of firearms. Right on cue on the 20th of July 2012, a 'spontaneous' eruption of terror occurred at the Century Movie Theatre at Aurora Colorado. The suspect for this event was one James Eagan Holmes. However witnesses claimed that there was more than one person involved in the shooting, including a person sporting a beard who opened the 'fire-exit' door to permit the gunman to enter as well as the fact that the 'tear-gas' grenades were thrown from a different direction from where the gunman was standing. When the local police chief, Dan Oates was being interviewed in regard to this event, the media also captured a person smirking in the background. That person was quickly identified as FBI Agent, James Yacone. 'Joe Quinn' of "The Sott Report" tells us that: The FBI agent with the smirk in the above video is James F. Yacone. In 2011 he was named special agent in charge of the FBI's Denver Division by Director Robert S. Mueller III. Before his Denver posting, Yacone served as a section chief in the Critical Incident Response Group (CIRG), which involved direct management and oversight of the FBI's national tactical program, crisis negotiation program, and a variety of mobility and crisis response assets. The CIRG is basically the military wing of the FBI and it "works to successfully resolve critical incidents worldwide." Yacone was a natural choice for this position given his background. He served eight years in the US Army and is "a decorated combat veteran". Specifically, he was directly involved in the 1993 'Battle of Mogadishu' that inspired the propaganda book and movie Black Hawk Down. Mr. Yacone served as an assistant special agent in charge of the FBI Richmond Division's National Security Branch from 2007 to 2009. In addition to the counterterrorism, counterintelligence, and intelligence programs, he also implemented the FBI's new threat-based intelligence process for two FBI field divisions. This resume is written in the 'Bureaucratic' language. Let us see jest exactly what it means! Yacone served as a section chief in the Critical Incident Response Group (CIRG), which involved direct management and oversight of the FBI's national tactical program, crisis negotiation program, and a variety of mobility and crisis response assets. The CIRG is basically the military wing of the FBI and it "works to successfully resolve critical incidents worldwide." Firstly the 'FBI' is the 'Federal Bureau of Investigation', an American federal body, and as such only has power in America that relate to its 'Federal powers'. The 'FBI' does have powers within American Embassies overseas, but again, once the FBI steps outside those boundaries the only power they possess is that of "Bluff". "Yacone served as a section chief in the Critical Incident Response Group (CIRG)". What we have to consider here are those responsibilities that rested with Yacone; as in 'direct management', FBI's national tactical program, crisis negotiation program, and 'crisis response assets'. FBI Agent James Yacone now has connections to every other major event within America that has occurred since July 2012. He served eight years in the US Army and is "a decorated combat veteran". Just exactly what does this tell us? There is no unit or rank, but I feel safe to say that Yacone was not a non-commissioned officer. Specifically, he was directly involved in the 1993 'Battle of Mogadishu'. Now this does tell us something. The Battle of Mogadishu involved the American 'special forces' trying to take out a local 'War-lord'. Things went badly wrong, and the locals being armed, just like the local Americans with their '2nd Amendment', shot the s**t out of the 'Special Forces'. For this very reason, Special Agent, James Yacone does not believe in the 2nd Amendment, especially when his men could become targets in America. It also tells you of another quirk of Yacone's, that being he is an elitist, one of the new 'aristocracy' of the ruling class in America. Mr. Yacone joined the FBI in 1995 and was first assigned to the Philadelphia Division, where he investigated violent drug trafficking organizations, organized crime, and financial institution fraud. The duties named within this sentence are known as 'General duties', and normally carried out by the rank and file policemen within that area. Within a 'Resume' it is called 'Filler'. During his tenure with the CIRG, Mr. Yacone was promoted to supervisory special agent and later unit chief, deploying to multiple critical incidents and major investigations around the world in support of the global fight against terrorism. Now this is more 'with it', as it gives the reader something to work with. I doubt if James Yacone was involved with the investigations into the Madrid Railway bombing, or the London bombing of 7/7/05. It is the thoughts of Mogadishu that reminds me of how the American 'Intelligence' units used to interrogate North Vietnamese prisoners. They used to take them for a ride in a helicopter, open the door and chuck a couple out. Then they would ask their questions of the remaining POW's and depending on the answers, or just how their inquisitors felt at the time, whether the POW's survived or joined their flightless comrades. Once the events at the Century Theatre at Aurora Colorado are properly studied, it becomes extremely clear that the only person with the 'expertise' to create such a 'critical incident' as this massacre was, was Special Agent, James Yacone. On the 14th of December 2012 an 'ERT' exercise took place at the Carmel School in Connecticut. For such an 'exercise' to take place, the 'Exercise Co-ordinator' could not use a school that was in proper use at that time. They had to use a 'vacant' school. After the 'exercise' was completed, a local news media helicopter flew overhead, and so the local ERT team, not being too intelligent, created a 'chase' for the media to film to demonstrate just how good they were and to give the locals something to watch. It later stated that the person chased and apprehended by the police at 'Sandy Hook' was in fact an off-duty ERT policeman armed with four handguns! The real Sandy Hook Elementary School though had been vacant for years, and fenced off permitting this school to become quite dilapidated simply due to 'Asbestos' that was contained within the buildings. The presence of asbestos meant that the school could never be used, and it would be extraordinarily expensive to demolish, so it was simply fenced off and left to ruin, until such time as the government could obtain sufficient monies to pay for its demolition. Naturally the 'media' had a field day interviewing all the various parents/actors and even some of the actual police 'first responders', but it was not until the Boston Marathon bombing that a vital piece of evidence came into being. What we have to consider with all the evidence that demonstrates that the Sandy Hook Massacre was a total hoax is that the required legislation that was introduced on the 23rd of February 2012 by four Senators, Mikutel, Fasano, McLachlan and Suzio, in regard to nondisclosure of underage homicide victims. This simply demonstrates that the 'Sandy Hook' massacre had been planned prior to this date. The fact that the State Coroner, H. Wayne Carver II disputed this 'required' legislature informs us that he was not part of the scheme at that stage. On the morning of the 14th of December 2012, The Department of Homeland Security was running an 'Exercise' (FEMA L-366 Planning for the Needs of Children in Disasters) at the Carmel Elementary School in Connecticut. At this school were assembled all the various players needed for such an exercise. There were the various 'first responders' including the actors to play the roles of children, and 'their parents', as well as 'The Putnam County' Emergency Response Team. To quote the Putnam County Courier: "Ironically, members of the Putnam County Emergency Response Team—a highly trained group of officers used when crises of this type occur—were training Friday in Carmel." So just exactly what actual police members were assembled at the Carmel Elementary School? Just exactly who are these three men posing as 'first responders'? Could they be 'FBI CIRG' as per James Yacone? On Monday the 15th of April 2013at 2:49pm, approximately two hours after the winners had crossed the finish line of the Boston Marathon, two bombs are detonated. At this time most of the dignitaries and other 'hangers-on' had departed the scene, but with 5,700 competitors still in the race, the crowds are enjoying the event. Thousands of spectators flee the scene in fear of their lives, and people are reported to have been killed or wounded by these two bomb blasts. The FBI takes command of the 'investigation', aided by all of the various alphabetic bureaucracies, the BATFE, the CIA, the NCTC and even the DEA. In an article by Anthony Gucciardi, we are told that, "Boston marathon runner Alastair Stevenson says that before the explosions erupted at the Boston Marathon this morning, he was told by police over the loud speakers that bomb squads and bomb sniffer dogs were part of a 'training exercise'. There was also mention of 'Police snipers' on the roof-tops. Again from Anthony Gucciardi we have, "There has been much discussion over two individuals fitted with earpieces and military-esque gear spotted at the Boston Marathon, but as it turns out they may likely be employees of the Blackwater-style private military/security firm 'Craft International'. To negate the earlier belief of 'Craft' involvement we have this from bitshare.com/; "The military looking guys in the video/photos (as pictured above) are actually Massachusetts Guard's 1st Weapons of Mass Destruction Civil Support Team (WMD CST). You may be asking yourself, what they were doing there? Good question. Since the Boston Marathon is so huge, the National Guard plays a significant role, and at the Boston Marathon there were several hundred national guardsmen on duty that day, including small factions of the (WMD CST). Their job isn't to be first responders, their jobs are to find out what's going on, and see if there are additional threats. That is what they were doing there." This last paragraph is pure bunkum, as in any normal situation where police and 'other' support groups work together in large 'public events' the police and 'other support groups' are interwoven so as to give a more cohesive action. What was extremely noticeable was the 'absence' of any police in the specific areas where the two bombs were detonated. In this photograph we have an FBI bomb squad truck that has arrived, on cue. We have the driver of this vehicle standing at the front of the vehicle talking with two 'Craft' guys and another person in a blue top is standing next to her. The front passenger door is open and another 'Craft' guy appears to be reaching into the passenger compartment of the truck, and the driver is not even batting an eyelid. Now, if this was your vehicle would you be concerned that somebody not known to you was opening the passenger door, especially when two bombs have just gone off? Even if it was 'just a drill', would you still let some unknown person into your vehicle? In other words, the 'guy' in the truck is FBI! Not 'Craft', not WMD CST, but FBI. There were two bombs that had to be detonated, as well as charges placed in shop windows to cause the plate glass to shatter and fall outside the actual shops. Had the bombs been real, then the glass panes would had shattered violently into shards and followed the force of the blasts and thus into the shops killing or injuring staff and customers. As it was the glass lay on the footpaths in opposition to the bomb theory. In this picture we see one ambulance to tend the 150+ wounded and killed, one old gentleman with an empty wheelchair, and most people are either standing around or walking away. It is not the 'real thing, it is a police drill. So who did set of the 'explosions'? Could it be this guy? Of course not! Infowars tells us that this picture was 'snapped a few moments after the first bomb detonation. Infowars also tells us that the device he is holding is an "Inspector Radiation Alert" device that detects radiation from a dirty bomb or nuclear attack. Apparently this 'Craft' guy is really 'Inspector Gadget' of the cartoon fame. Here he is again. Oh, by the way there is an empty red wheelchair under the tree by the kerb. I wonder what happened to its occupant? What is interesting is that the man with the 'Inspector Radiation Alert' has a backpack on; his two companions do not appear to be wearing backpacks. Now have we seen these gentlemen before? Of course we have. Sandy Hook HOAX ultimate re-upload. Let us go back to FBI Special Agent James Yacone. Yacone served as a section chief in the Critical Incident Response Group (CIRG). During his tenure with the CIRG, Mr. Yacone was promoted to supervisory special agent and later unit chief deploying to multiple critical incidents. 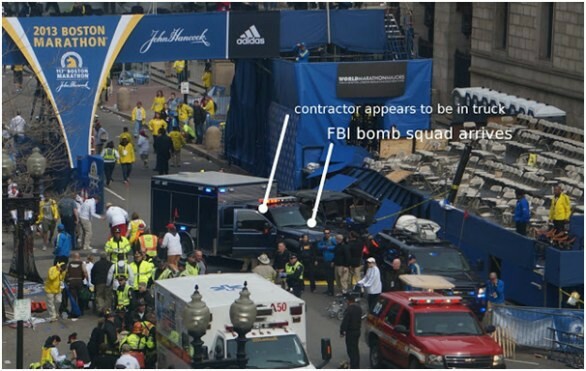 What we have here are three men, who by the actions at the FBI bomb truck demonstrate they are part of the FBI. We have these three men being deployed at both the 'Sandy Hook' hoax, and the Boston Bombing drill. That means that these three men are actually part of the FBI 'Critical Incident Response Group (CIRG) as they have been deployed to two (known) critical incidents. The possibility that these three men also placed and detonated the bombs in the Boston Marathon has also got to be extremely high. We will now move on to the Tsarnaev Brothers. 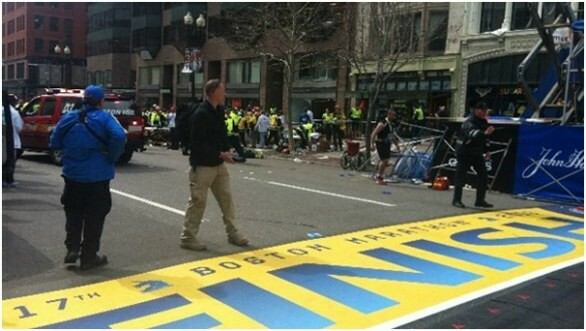 Immediately after the Boston bombing, police and FBI initiate a search for 'the bombers'. They start collecting all of the various CCTV videos from the various businesses and any other source. On the evening of the 15th of April 2013, a police report states that the 'bomber' has been apprehended and is to be charged at a local court house. The media rush to the courthouse, only to find the building locked and the police reports of the apprehension of the 'bomber' denied. The police now instigate a 'major search for the 'Boston Bombers', identified as two brothers, Tamerlan and Dzhokhar Tsarnaeu. 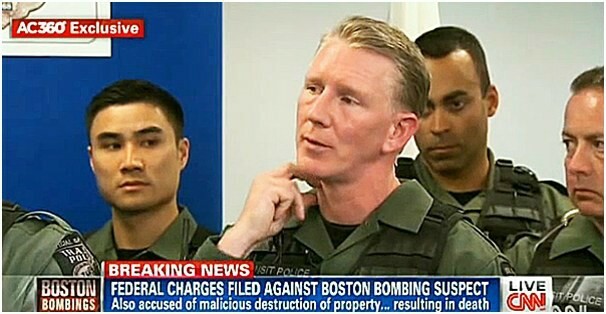 So, just exactly how did the Boston Police, superbly aided by the FBI/CIA identify the 'bombers'? That is easy; Tamerlan Tsarnaev was a FBI/CIA operative and had been employed by them for a number of years. How did the 'Boston Police/FBI manage to arrest Tamerlan Tsarnaev so quickly? Again that was easy. Tsarnaev was 'arrested' when he went to report to his superior. The question now is why was Tamerlan Tsarnaev framed by his own 'people'? The answer is that Tsarnaev had unwittingly received information that was 'extremely classified'. What was this information? All in good time. On the evening of the 18th of April, police are reported to have killed the main 'bomber' suspect, Tamerlan Tsarnaeu after which he was run over by an SUV driven by his 19 year old brother, Dzhokhar Tsarnaeu who fled the scene. This report is later denied by an independent witness who states that the police first ran over the suspect with their own SUV, and then fired shots into the body. By Friday the 19th of April an unarmed Dzhokhar Tsarnaeu is arrested by police after a supposed shootout in which the 19year-old was reported to have attempted suicide by shooting himself in the throat with a firearm he did not possess. However in a media interview, the Boston SWAT team that arrested Dzhokhar Tsarnaev described his throat wound as a 'knife cut'. Dzhokhar Tsarnaev was then conveyed to the 'Beth Israel Deaconess Medical Centre where he was treated by 'Israeli' doctors. Dr. Kevin (Ilan) Tabb told the Israeli website Ynet that Tsarnaev is in stable condition but that because of wounds to his throat, he may never be able to speak again. Now why would the Tsarnaev brothers both end up at an 'Israeli' hospital and be either treated or laid out in the mortuary? I would suggest that perhaps Dr. Kevin (Ilan) Tabb may belong to an 'Israeli Intelligence unit'. Whatever else, Dzhokhar Tsarnaev would never be able to inform anyone what his older brother Tamerlan may have told him on his return from Dagestan. There is now only one person left who Tamerlan may have passed on the information he received in Dagestan, his good friend Ibragim Todashev. On the 22nd of May 2013, the headlines stated "2 FBI Agents Involved in Dzhokhar Tsarnaev's Arrest "FALL" Out of Helicopter and Die". On Friday the 17th May 2013, Special Agents Christopher Lorek and Stephen Shaw died when they apparently fell from a helicopter during a maritime counterterrorism exercise. They were killed when they fell into the water. "The FBI agents were participating in a maritime counterterrorism exercise involving helicopters and a ship," said Special Agent Ann Todd. "The agents were in the process of fast-roping from the aircraft onto the ship when the helicopter encountered difficulties. The agents fell a significant distance and suffered fatal injuries." "The incident occurred about 20 kilometres from the coastline. The Coast Guard was not involved." "Both were members of the bureau's elite hostage rescue team." "Irwin Wells, a former FBI special agent who retired in 1990 after leading the Norfolk field office for three years, stressed that the Hostage Rescue Team is different from the FBI's regular SWAT teams. He noted that agents assigned to a field office's SWAT team also must perform other jobs inside the bureau, while agents assigned to the Hostage Rescue Team have no other duties. So when CNN interviewed the 'SWAT' team that arrested Dzhokhar Tsarnaev, the team's 'spokesman' was Jeff Campbell. 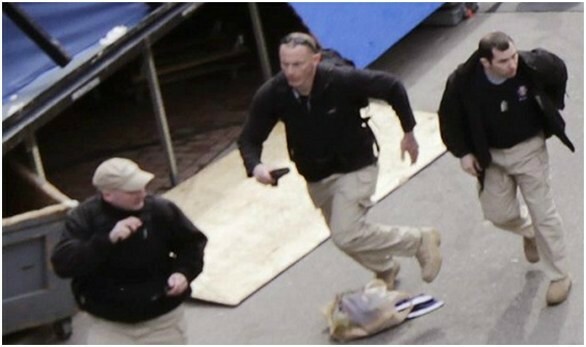 There is no evidence to suggest that either Lorek or Shaw were actually involved with the arrest of Dzhokhar Tsarnaev, but if they were, what would be their reaction when the other SWAT team members fire off 300 rounds at the surrendering Dzhokhar Tsarnaev? No wonder they fell out of a helicopter! Now there is one more death to consider, that of Ibragim Todashev. Three days after the deaths of Special Agents, Lorek and Shaw, Todashev was interviewed at his home in Orlando Florida by an FBI special agent from the Boston Field Office, who was accompanied by two Massachusetts State Police troopers. From Wikipedia. "and interviewed Todashev for approximately eight hours in his living room." The main question here is why would the FBI agent wish to interview Todashev in his own living room? The answer is that there were no CCTV cameras to record such interviews. From Wikipedia "Abdulbaki's American attorney Eric Ludin said Ibragim had undergone multiple prior interrogations in Florida and was promised this would be the last one, and had cancelled a planned trip to Chechnya earlier in May on the advice of the FBI." So, on the advice of the FBI, Ibragim Todashev remains in Orlando to be 'interviewed' again, and this time for over 8 hours. There is one action that the FBI did not want Todashev to take, and that was to return to Russia. Why? From Wikipedia "The investigators later said that Todashev implicated both himself and Tamerlan Tsarnaev in the (the 2011 Waltham murders) murders during the questioning soon after midnight. They reported that Todashev was beginning to write a formal statement when he asked to take a break, and then suddenly attacked the agent. Todashev was shot multiple times and killed". This is not correct for so many reasons. Firstly if Todashev was to be 'interviewed in regard to the 2011 triple murders at Waltham, then he would be interviewed at a proper facility and permitted legal assistance. So just after midnight, after 8 hours of being 'interviewed by the FBI, Todashev has started to write a 'formal statement'. Again, this is not proper practice. If this was correct, then all parties should have adjourned to the nearest police station. Now, how does one write a 'formal statement'? How about by sitting at a table with pen and paper. What a wonderful position in which to launch an attack! From Wikipedia "According to the account of an unnamed law enforcement official, Todashev knocked the interrogating agent to the ground with a table, and then lunged at him with a metal pole, or possibly a broomstick. In this account there was one detective in the room—who did not fire—besides the FBI agent. The agent sustained minor injuries requiring stitches." I shall be nice here. It would be assumed that the FBI agent was also seated at the table, when Todashev pushes the table into the FBI agent, knocking both the agent and his chair over and the table on top of him. We have one of the Massachusetts State Police troopers watching over this event. His reaction at this incident is to simply stand back and watch and in his best 'Gomer Pyle' accent says, "Oh golly gosh! Lookout Agent whatever, Todashev is going to attack you! A normal trooper would have moved in to prevent the 'attack'. The FBI agent ensnared by the chair and the table has to extradite himself, reach for his handgun, aim and then shoot Todashev several times whilst still lying on the floor. There are now three questions that should be considered. (1) What did Tamerlan Tsarnaev tell Ibragim Todashev? (2) Why did the FBI not want Ibragim Todashev to return to Russia? (3) Why was it necessary for the FBI to murder Ibragim Todashev? Could it be that Ibragim Todashev had finally admitted that Tamerlan Tsarnaev had given him information which he had passed onto his father? And that was when the FBI agent shot him for betraying American 'interests'. "Dead men tell no tales". Mrs. Tsarnaev tells us her son was known to the FBI. She also tells us that Tamerlan told her he had become an 'Islamic' extremist! Why? The family were not known for their religious beliefs, and also note that Tamerlan had married an attractive young lady and had started a family. In simple words, Tamerlan had been 'recruited' by the FBI/CIA as a 'conduit' to possible Islamic extremists, and his FBI/CIA cover, demonstrated that agenda. Again, we have been told by the media that Tamerlan Tsarnaev was in Dagestan, a region bordering Chechnya from January 2012 until June 2012. So who would Tsarnaev visit whilst in an area close to relatives and friends? Is there truth to the rumour that an American Foreign Affairs official in Chechnya is married into the Tsarnaev family? In this media report on Tamerlan Tsarnaev, we are informed that Tsarnaev attended a 'workshop' sponsored by the 'Jamestown Foundation'. [The Russian newspaper cites documents produced by the Counterintelligence Department Ministry of Internal Affairs of Georgia confirming that the NGO "Fund of Caucasus" held workshops in the summer of 2012 and Tsarnaev attended.] We are 'specifically' not informed of where this 'workshop was, but I believe we can assume that the workshops took place in 'Georgia'. To me, this paragraph is unclear. Did the FBI interview Tsarnaev in 2011, prior to his leaving for Dagestan, or on his return in 2012? The comments made by the FBI and Janet Napolitano, tell us nothing really, but the Secretary of State John Kerry is an idiot! How could Kerry substantiate his remark? What John Kerry has done though is tell us when Tamerlan Tsarnaev became 'the enemy'! From Infowars [The Caucasus Fund was established in November, 2008, following the Georgian-Ossetian conflict. The main purpose of the organization, according to Izvestia, is "to recruit young people and intellectuals of the North Caucasus to enhance instability and extremism in the southern regions of Russia." Moscow has explicitly criticized the Jamestown Foundation for engaging in an anti-Russian propaganda campaign. "Organizers again and again resorted to deliberately spreading slander about the situation in Chechnya and other republics of the Russian North Caucasus using the services of supporters of terrorists and pseudo-experts. Speakers were given carte blanche to spread extremist propaganda, [and] incite ethnic and inter-religious discord," said the Foreign Ministry of Russia in December, 2007. The Jamestown Foundation is a known CIA front. It "is only an element in a huge machine, which is controlled by Freedom House and linked to the CIA," writes the Voltaire Network. "In practice, it has become a specialized news agency in subjects such as the communist and post-communist states and terrorism." It "publishes specialized bulletins on both the post-communist world and terrorism, which serve as reference for Washington's think tanks. University scholars and journalists are dedicated to depict a ghost-filled world whose very same hostility justifies the US Empire." CIA director William Casey and Russian dissident Arkady Shevchenko were instrumental in creating the organization. Jamestown's board of directors includes Zbigniew Brzezinski, former National Security Advisor to Jimmy Carter. Brzezinski, a high-level globalist operative, initiated the CIA's recruitment of the Mujahideen in Afghanistan that ultimately produced al-Qaeda and the Taliban. The notorious Russophobe Brzezinski heads up the foundation's American Committee for Peace in Chechnya, an NGO based at the Freedom House, the latter funded by the National Endowment for Democracy, the CIA front designed to foment color revolutions and overthrow governments. It also receives funding from Soros Foundations, the CIA's Ford Foundation, and the US Agency for International Development, the outfit used by the US government to run "humanitarian" NGOs instrumental in running color revolutions in former Russian states. The revelation about Tsarnaev's whereabouts in 2012 and his connection to an anti-Russian NGO sponsored by the CIA should be considered the missing link in the story concerning his purported radicalization at the hands of Salafist militants. However, since the establishment is providing the script and narrative for the official story, we expect the corporate media to give it zero credence. (This article was posted: Wednesday, April 24, 2013 at 12:30 pm)]. I would believe that it is fair enough to state that Tamerlan Tsarnaev had been recruited by the CIA. The question that poses the most intriguing answers though would be; "Just exactly who did Tamerlan Tsarnaev meet at the workshop in Georgia?" Was it Dmytro Yarosh? The other question has to be; "Why was it that John Kerry considered Tamerlan Tsarnaev 'the enemy', when he returned from the CIA workshop in Georgia? What one has to consider is that Tamerlan was not set up for the Boston Bombing by coincidence. There has to be a particular reason for it, and one that Tamerlan is totally unaware of. It cannot be that Tamerlan has committed some indiscretion, as such a matter would have been settled in the normal manner. The other facts which include the attempted murder of Dzhokhar Tsarnaev, and then the outright murder of Ibragim Todashev, who had been also stopped from returning to Russia by the FBI. The only conclusion that I can come up with is that these events were due to 'National Security', and the trigger of these events was when Tamerlan was overseas. Again, the main event for Tamerlan going overseas was to attend the 'workshop in Georgia! From Voltaire-net [Under the control and in the presence of US diplomats, the Verkhovna Rada of Ukraine carried out a coup d'état, on 22 and 23 February 2014. Then, 328 MPs out of 450 repealed the Constitution, substituting it with that of 2004, that is to say without a referendum and in an emergency situation, thereby contravening Articles 156 and 157 of the Constitution. Overstepping his interim powers, "president" Turchinov appointed his friend Valentin Nalivaytchenko head of the security service, and then called for a presidential election on May 25 for which Yulia Tymoshenko should be a candidate. From Voltaire-net [The Prosecutor General of Russia has opened an investigation into public calls for terrorism inside Russia posted by Dmytro Yarosh on his website. What better place would there be for Dmytro Yarosh to pick up a 'likely' recruit than at the CIA workshop in Georgia? Would Yarosh, as one Chechen to another inform Tamerlan of the 'coming' revolution, as well as who was doing the backing once he was aware that Tamerlan came from America? And once Tamerlan Tsarnaev was aware of the coming event, would he inform his very good friend, Ibragim Todashev, who could very well inform his father, Abdulbaki Todashev who was a 'high ranking pro-Moscow official' in Grozny. Would Tamerlan Tsarnaev also chat to his younger brother Dzhokhar about what he learnt in Georgia? Do you understand now why the Tsarnaev brothers had to die! Do you understand why the FBI special Agent murdered Ibragim Todashev? Can you understand why the two agents from the 'Hostage Rescue Team' who would have flipped when the other SWAT teams started to shoot at an unarmed youth surrendering to them and thus earned themselves a one-way helicopter ride! Postscript There were a couple of things that I didn't put in the article, but I believe they were worth thinking about. They relate to the murder of Ibragim Todashev, which I would have to consider as being 'premeditated'. My thoughts are firstly, that these particular events overall would have been run by one 'unit'. I mean my experience tells me that the more people, the more units, or the larger the group involved, the bigger the chances are that things can go wrong. So the first question is; just exactly who would have been the FBI 'Special Agent' that conducted the final interview, and then murdered Todashev? Please remember that it has been reported that there had been several previous interviews by the FBI, and that Todashev had been requested to remain in Orlando for this special interview. This tells me that the 'special agent' was in fact the overall commander of the group. I believe that the possibility that it was James F. Yacone would have to be extremely high. In the police farce, I learnt about 'corroboration' and normally there would be 'two' policemen conducting an interview, so as to back each other up by corroborating with each other. That is why most FBI agents travel in pairs. But on this occasion, this did not occur. The 'special agent' permitted himself to be corroborated only by 'two Massachusetts state troopers'. You have to be kidding, right? How do we know that they were Massachusetts State troopers? Perhaps they were in uniform, although in part of one article the trooper is called a 'detective'', and detectives normally wear mufti. (plainclothes). For the 'special agent' to act in the manner he did in murdering Todashev, tells me he had complete faith in 'his' back-ups' even though they were State troopers only. I think that is cowdung! I think the 'State troopers were also FBI, and the likelihood that they would be part of the 'select' group called CRIG, is again extremely high. Now Yacone's appearance at Aurora was not coincidence. He was there for a specific reason, that being to run the Aurora Massacre. To me, that would suggest that he would also have run the Sandy Hook massacre, and again the Boston bombing. I believe Yacone would have been promoted to a 'new' unit especially for these events in 2012, and the reason why the first event took place in Colorado, was because that was Yacone's old tramping ground. I also believe that the so-called 'two State troopers' from Massachusetts were in fact from the 'three men team' at both Sandy Hook and Boston. To my thinking, the 'Special Agent' that murdered Ibragim Todashev has to be James F. Yacone. His two 'offsiders' being the supposedly Massachusetts State Troopers have to be part of the CRIG, and thus two of the three men already identified as FBI at Sandy Hook and Boston. Now the final question should be in regard to the length of time it has taken for Ibragim Todashev to be 'executed' by the FBI. The explanation for that goes back to the 19th of April and the 'arrest' of Dzokhar Tsarnaev. The media has informed us that the two FBI Special Agents, Christopher Lorek and Stephen Shaw were in charge of the FBI squad that 'arrested' the 'bomber suspect' Dzokhar Tsarnaev on the 19th of April 2013. Both of these men belonged to the 'Hostage Rescue Team' and as such would have to be considered 'out of the loop' or not aware of Agent James F. Yacone's agenda. I would suggest that when 'Yacone's SWAT teams opened fire on Dzokhar Tsarnaev as he emerged from the boat he had been hiding in, that both Lorek and Shaw ordered an immediate ceasefire, and thus saved the young Tsarnaev's life, but were unable to stop one of the SWAT team from slitting his throat. Lorek and Shaw's response to this felonious behaviour would have been to confront Special Agent James Yacone, and inform him of their observations of his criminal behaviour, and threaten retaliatory action if it continued. I would also believe that both Lorek and Shaw would have then written a full report on what they observed to be forwarded to the Head of the FBI, Director Robert S. Mueller. If the problem that had arisen here had stayed with the FBI Director, then Mueller could have informed both Lorek and Shaw that Yacone's actions were valid in the 'present situation' and ordered both Lorek and Shaw to desist from their objections. However, this would have left a possible impediment to Yacone's course of action as if he continued to murder what he considered a 'security breach', the possibility of Lorek and Shaw exposing the affair was a strong possibility. This means that Special Agent James F. Yacone had to take measures to remove that threat. I cannot see FBI Director Robert S. Mueller authorising the murder of two of his agents. Nor can I see Yacone approaching Mueller for that authorisation. To accomplish this act, Yacone had to go above Robert S. Mueller, and that simply means, the Secretary of State, John Kerry. Again there is no reason to believe that FBI Director, Robert S. Mueller was aware of the problems that involved the situation in Kiev, but the Secretary of State, John Kerry was very well aware. Special Agent James F. Yacone received the authorisation to murder FBI agents Lorek and Shaw. On Friday the 17th of May, those actions were carried out. Then three days later on the 20th of May, Yacone murdered Ibragim Todashev. On what authorisation were the murders of FBI Special Agents Christopher Lorek and Stephen Shaw murdered? Remember President Obama's 'Executive Orders' for the assassination of American citizens! The only possible authorisation for the murders of Lorek and Shaw has to be President Obama's Executive Order issued in 2011. The first Americans to be assassinated under the 'Executive Orders' were two FBI agents who had retained their integrity!